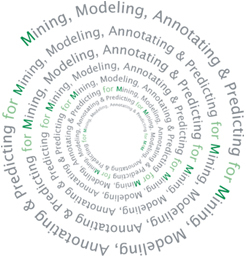 M4M is an ongoing program of research devoted to the incremental learning of networks by mining, modeling, annotating and predicting their constitutive elements at different levels of detail. Mining to discover features that characterize network elements and their relationships from different perspectives. Modeling features by encoding data into a flexible computational framework. Annotating network elements based on distinct profiles derived from combining features. Predicting new network elements that resemble the discovered profiles.